Newer windows except two in upstairs bedroom. Newer gas stove over the stove microwave and dishwasher new stainless steel sink and faucet. Roof and skylight installed in 2012. Walking distances to Wingate South park with trails and small pond, community pool, and schools. 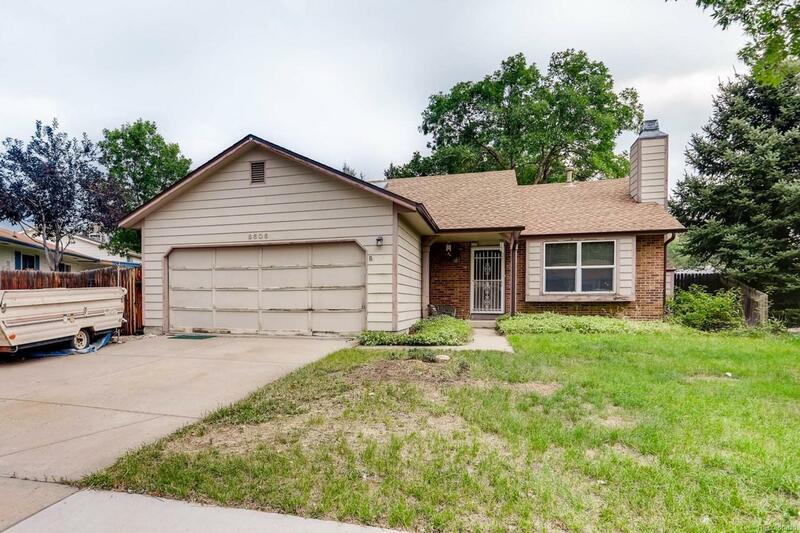 Needs cosmetic changes (paint, siding repair and some flooring) but is priced accordingly (quite a bit lower than comparable houses in the area).Window evaporative cooler in garage can be included. The water hose for it is next to the front porch. Highly desired neighborhood since there not any covenants or an HOA. Excellent location within minutes of Chatfield State Park, 470 corridor, the Denver Tech Center, Foothills Rec Center, Bike Paths (e.g. Lakewood to Downtown Denver) and scenic views to the West along 470 (e.g. Mountain Vistas, Red Rocks, etc). Home sold as is. Buyer can perform inspection, however Seller will not make any repairs. 4th bedroom does not have a closet.